Seven mountains surround Bergen and the city rises up from vibrant Vagan Harbour into the steep hills behind. 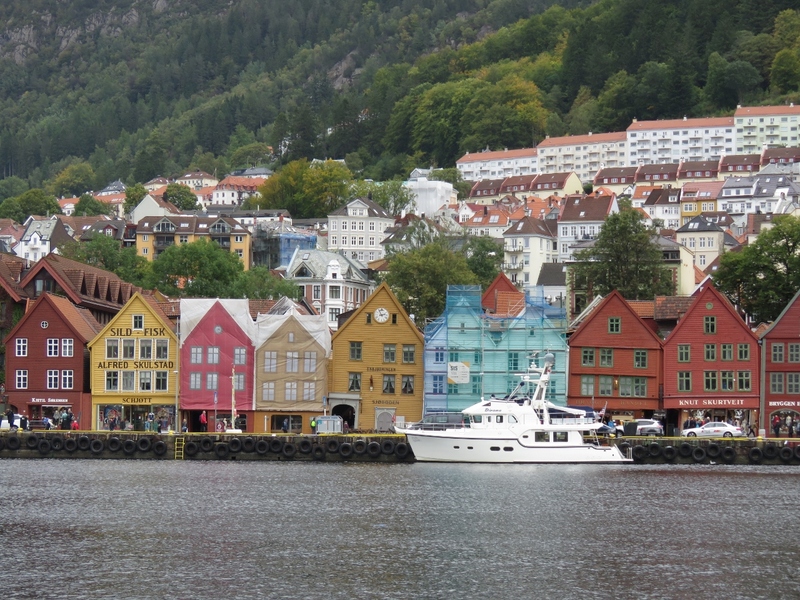 We moored right downtown and spent our first day on a walking tour of Norway’s second-largest city. 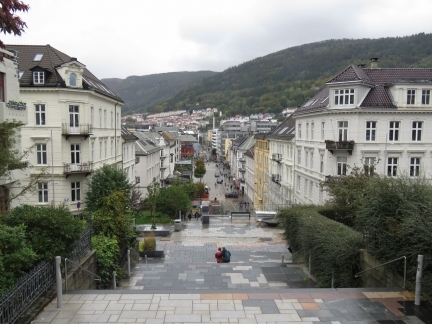 It’s easy to see why many consider Bergen to be one of the most beautiful cities in the world. Coming into Bergen just over four months after we’d passed the city heading north on May 1st. 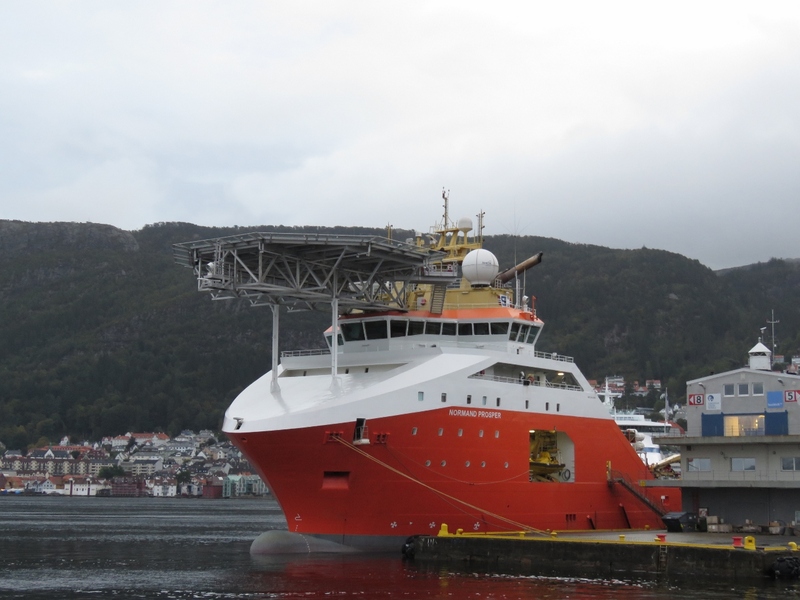 The huge helicopter deck on the Normand Prosper moored at Bergen. Bergen Search and Rescue vessel. 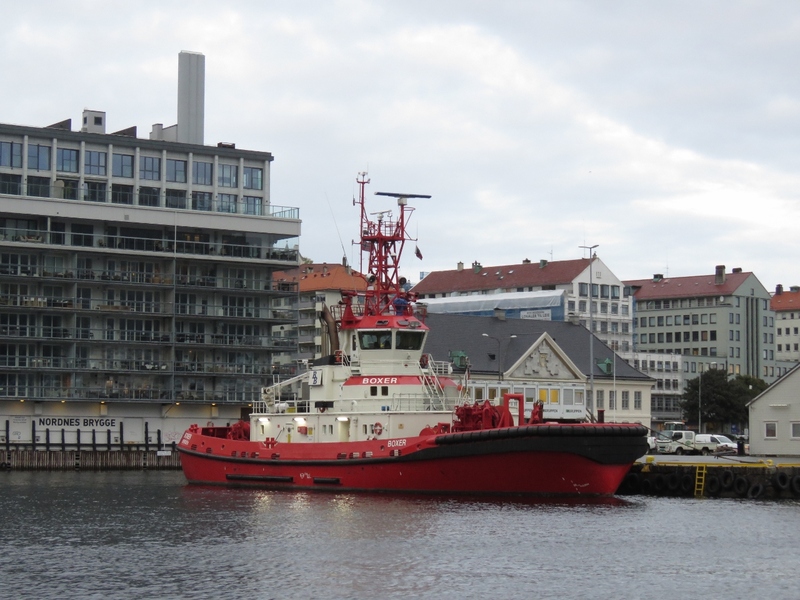 Beautiful 6,800HP tractor tug Boxer moored at Bergen. If the design looks familiar to Puget Sound readers it’s because the Crowley Response-class tug is based on Boxer’s design. 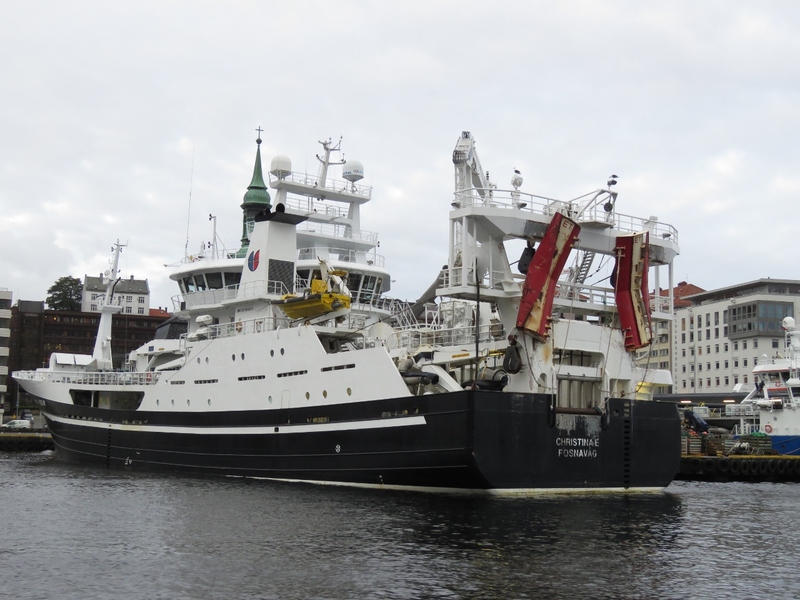 The dual-purpose trawler Christina E was designed for both fishing and applications in the oil and gas industries. Looking towards Bergen Havn where we’ll moor, with two of the city’s seven surrounding mountains in the background. 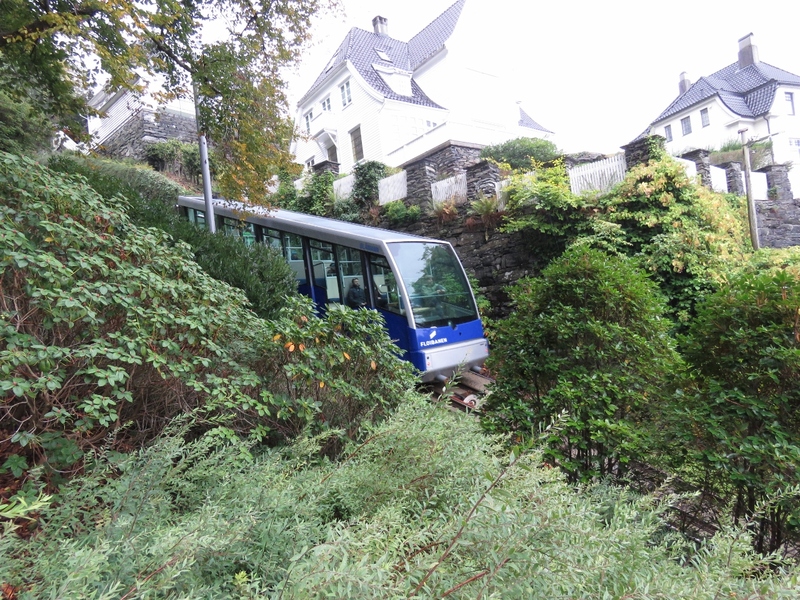 Slightly left of center is the top part of the funicular railway leading to viewing platform at the summit of 320m Mt Floyen. 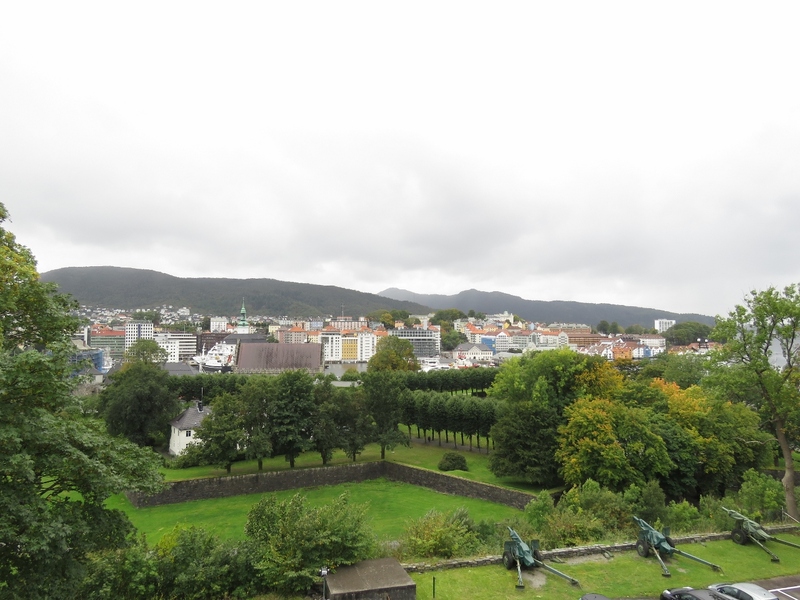 Right of center is the massive radio tower atop 642m Mt Ulriken. Winds are forecast to reach 61 kts in Bergen this Thursday, although we’re told it’s not likely to get nearly that high in the harbor. We’ve encountered a remarkable number of different ways of paying for power as we’ve travelled. In Bergen, you pay at a central kiosk where you enter the power pedastal that you chose to plug into. Unfortunately you can’t tell it the outlet number and it chooses one of the unused plugs for you. 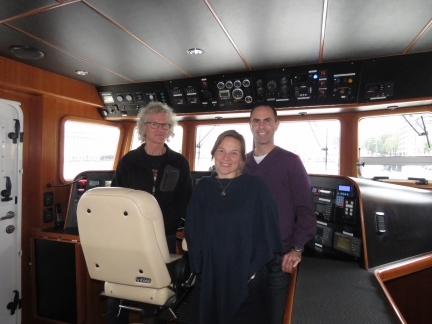 So unless you are very lucky, you have to return to the boat and plug into the one it chose. We weren’t lucky, so after moving our plug, we needed to confirm we actually had power. 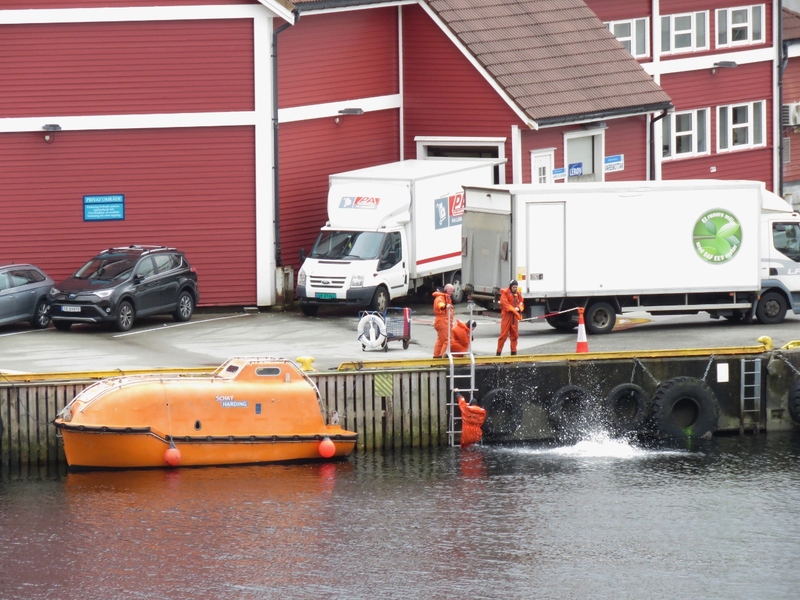 Rather than getting on the boat, we could just check on Maretron N2kView on our phone. And yes, we now have power. 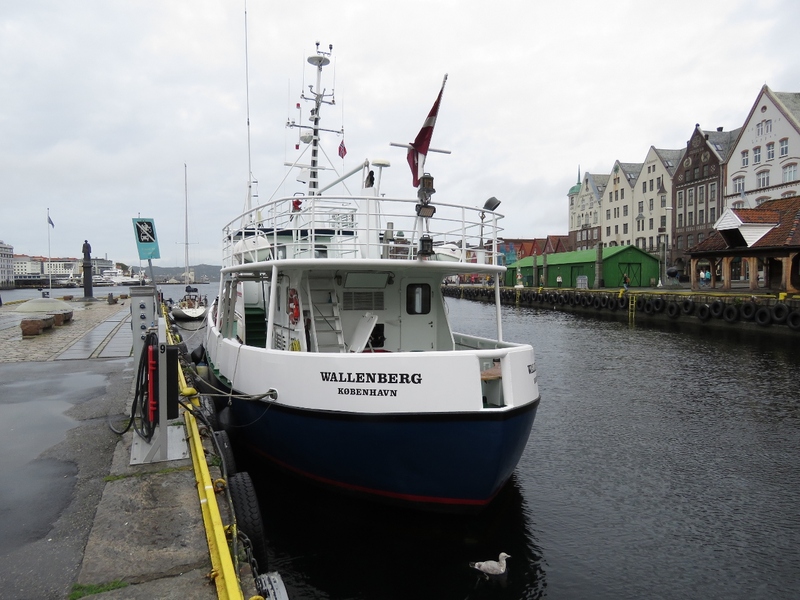 The immaculate Wallenberg owned by Danish journalist Mikkel Beha, who has produced a number of documentaries covering his journeys across the Atlantic and Pacific in his previous yacht Havanna. Beha has spent the past 18 months refitting Wallenberg with plans to visit Svalbard. Blog reader Erik Andersen noticed the vessel was near us and gave us the background. 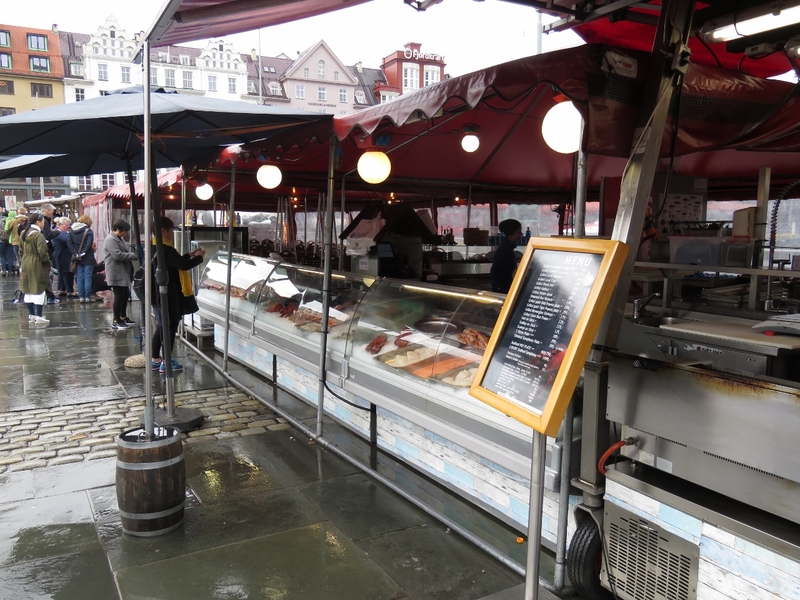 The fishmarket at the head of the harbour is just opening up for business. Several are combined cafes as well as fresh seafood sales. 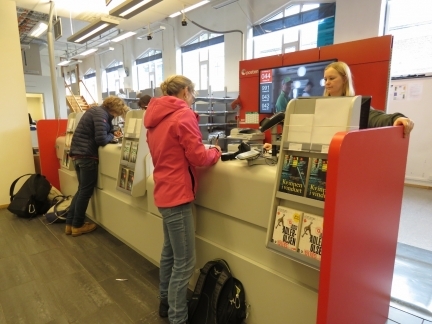 At the Bergen post office to mail a package. 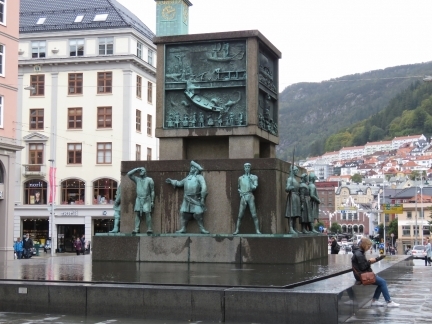 The Sailor’s Monument in Torgallmenningen, Bergen’s main square, honors Norway’s seafaring achievements since the days of the Vikings. 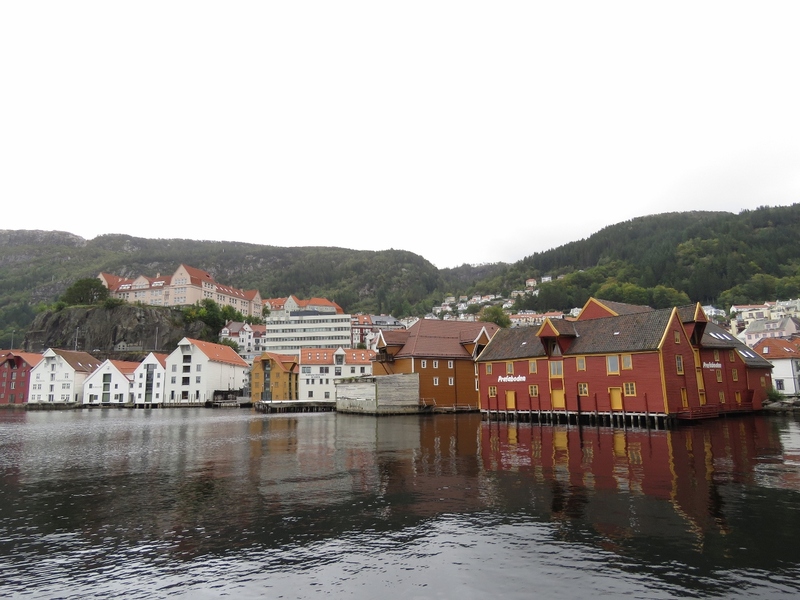 View across the harbor to Dirona moored in front of Bryggen, Bergen’s oldest quarter. 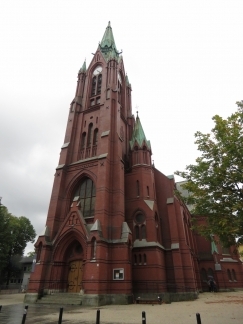 The buildings date from the 18th century, but follow 12th-century designs. The cruise ship AIDAvita, that we saw a week ago at Olden. Waterfront buildings in Skutevik behind the cruise ship dock. Entering Rothaugtunnelen, a former bus tunnel that is now closed the motor vehicle traffic. Sandvik Church, dating from 1881. 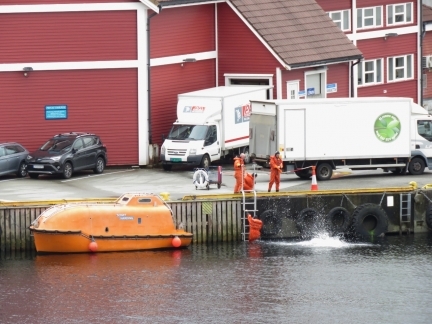 A group doing abandon-ship drills in survival suits. The view west from the ruins of Bergenhus Castle, among the oldest and best-preserved fortresses in Norway. 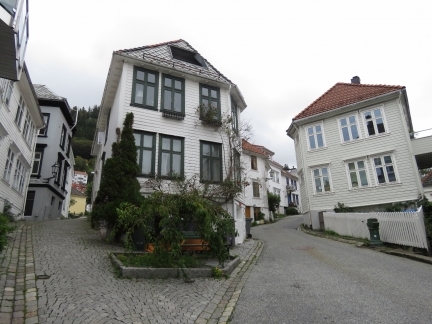 The residential area in the hills above Bergen is full of narrow cobblestone roads and footpaths winding through century-old buildings packed into every available scrap of land. 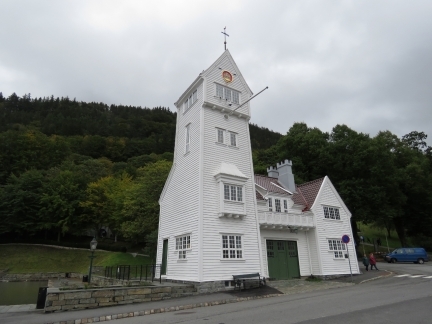 The old Skansen Fire Station was built in 1903, following a disastrous 1901 fire, and was in operation until 1969. 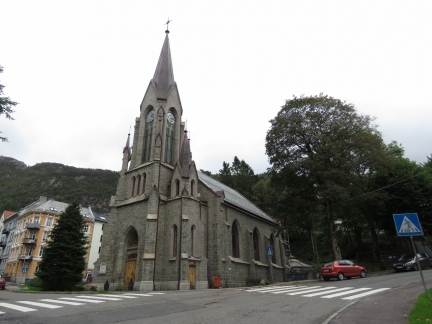 The station was built up on a hill with a watchtower to look for fires. 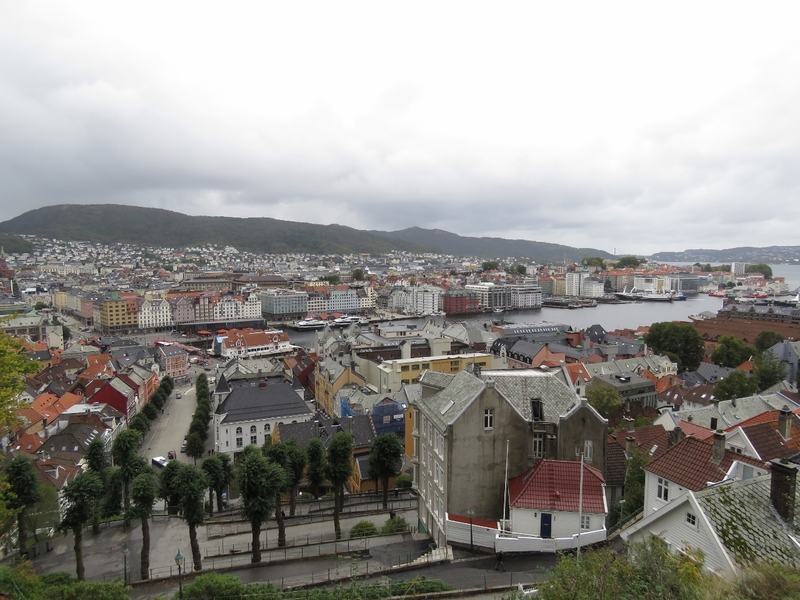 Looking across Bergen from a viewpoint opposite the Skansen firestation. A tram passing up tthe Floibanen funicular to the top of 320m Mt Floyen. 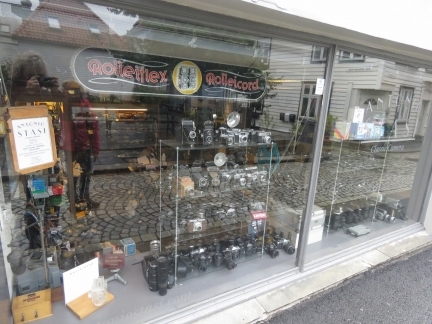 Antonio Stasi’s Classic Camera store has an amazing collection of classic and antique cameras. 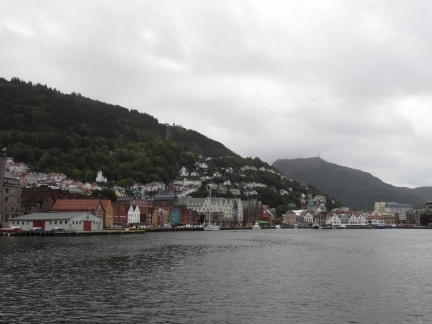 This is the last port we’ll see a Hurtigruten—Bergen is their most southern port of call. 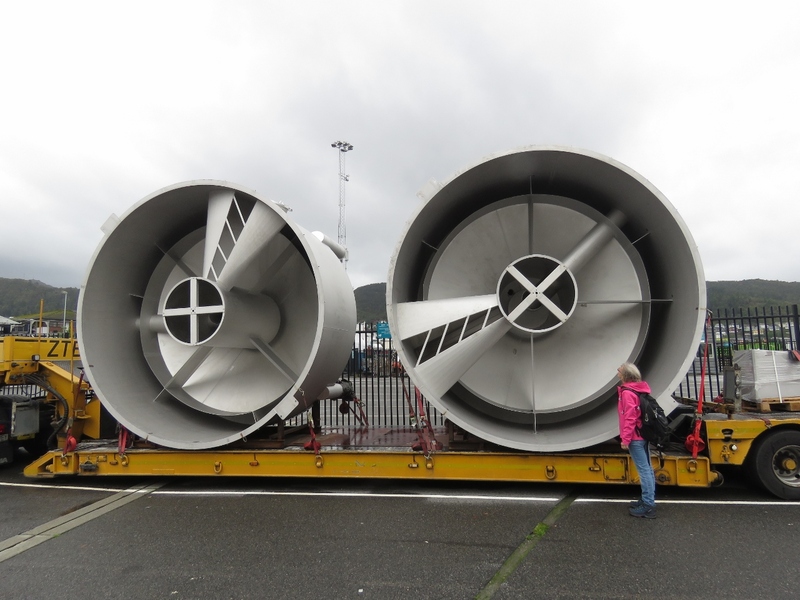 Huge fan housings in transit near the Hurtigruten terminal. Parish church Johanneskirken was consecrated in 1894 and seats 1,250 people. Looking northwest down the pedestrian mall Vestre Torgatten. 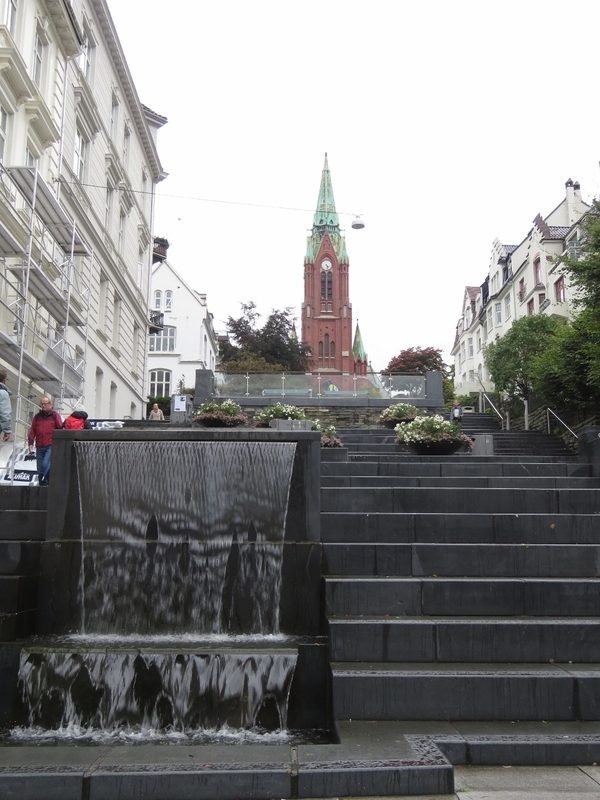 Water cascades down channels in the steps of Vestre Torgatten, culminating in this beautiful waterfall, seen looking back up to Johanneskirken. 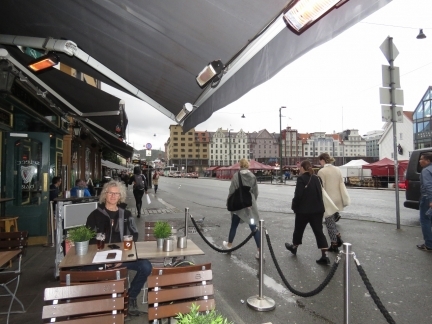 Having a beer street-side at Bergen’s only Irish pub, Scruffy Murphys. 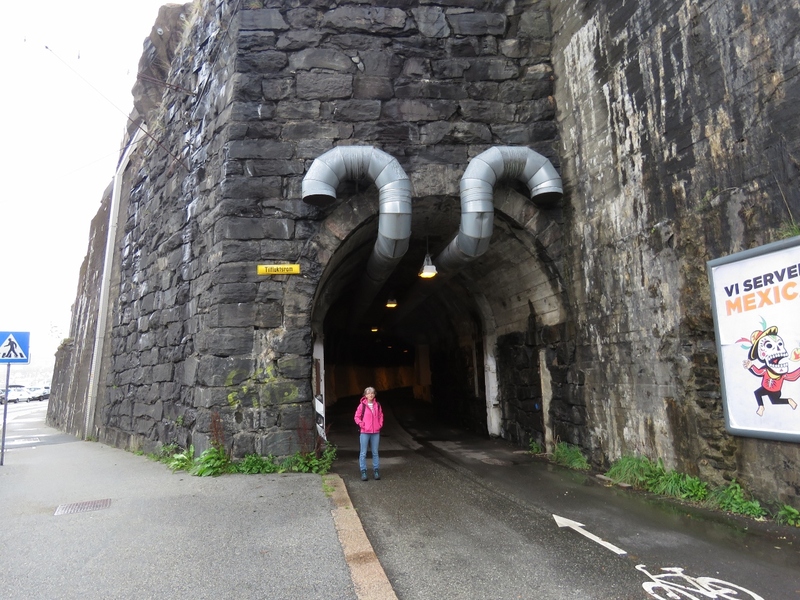 We like to tour a city by foot when we first arrive and covered over nine miles this afternoon. 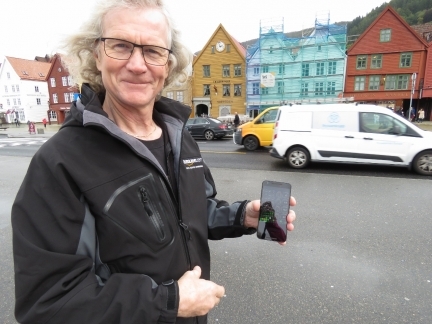 Blog reader Trond Saetre has been following us since we left Hawaii and has been giving us lots of excellent advice and local knowledge since we first neared the Norwegian coast. He also picked up a few supplies for us in Bergen. After corresponding for months, it was wonderful to finally meet in person. 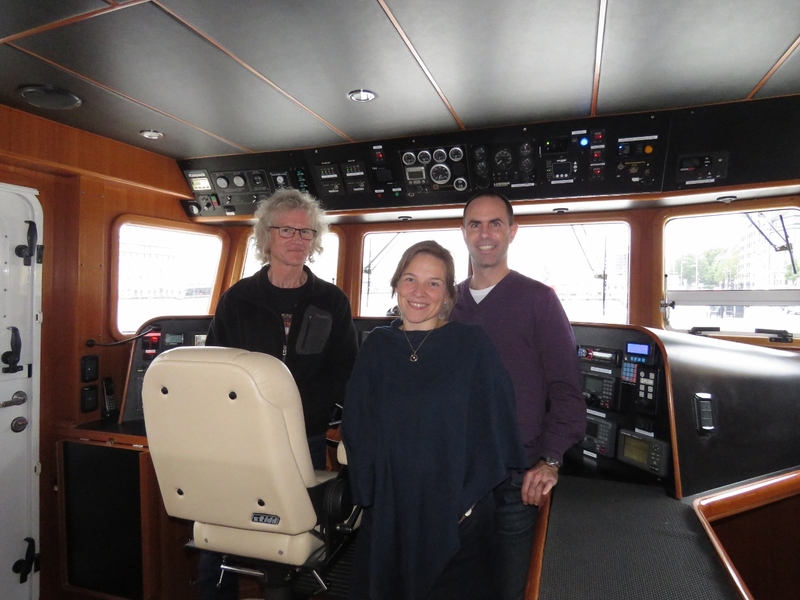 We had an excellent evening with him and Morgareth Baartvedt, first on Dirona and later over a dinner at the Harbor Cafe overlooking the waterfront. Intruders! Thats scary, do you have cameras recording? 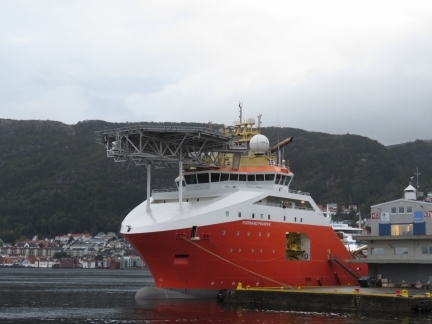 What if any do you carry on board for your safety ? Perhaps a laser trip setting off a barking dog recording. 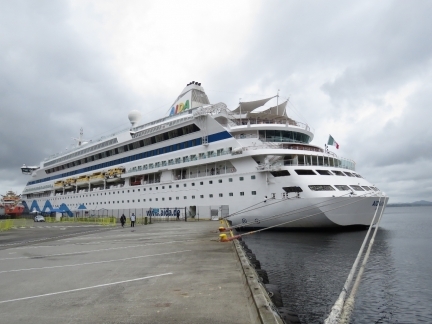 I did have a look at the video recordings and, on the forward camera, we can see a girl and two guys leave a bar across the street and walk across to the water side of the street where we were moored. 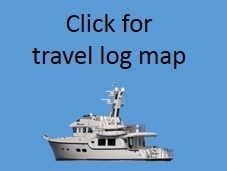 On the stbd side camera, we can see them walk part way past the boat, then one of them walked back towards the boarding door, then the other two did, and all were out of the field of view briefly in the boarding door area, then 2 of them walked away quickly, followed by the last one running. Probably just playing around. It was great to finally meet you in Bergen. Hopefully our paths will cross again. 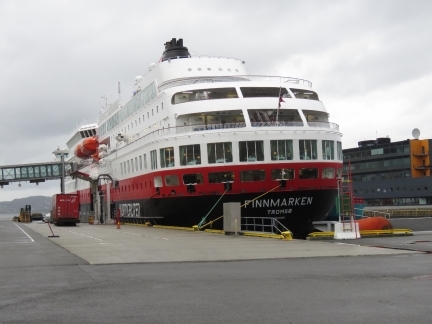 Trond, thank you for all the advice on things to do and routes to follow while we are in Norway. We’ll miss your detailed advice. 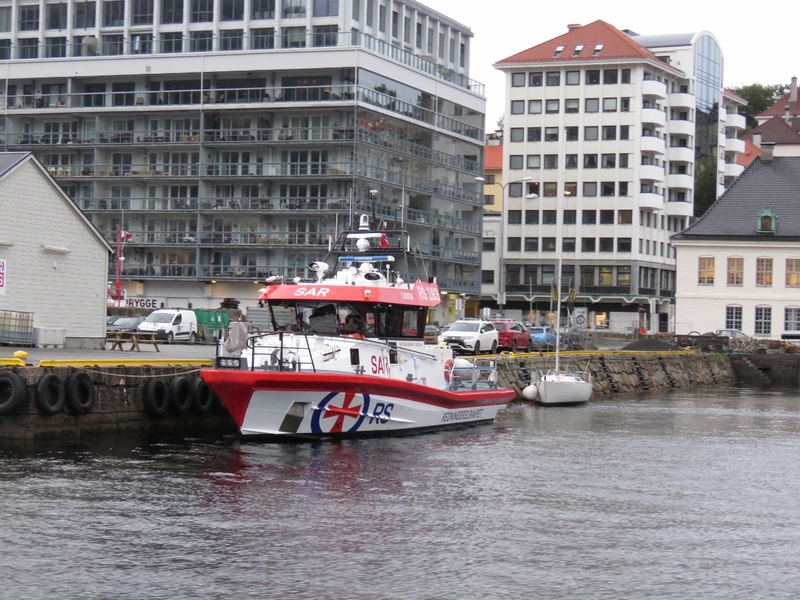 We’re currently about 6 nautical miles off the coast of Denmark and will be arriving in under an hour. We plan to spend time in Sweden next summer but I suspect we’ll visit Oslo in the fall. If you and Morgareth happen to be in the area while we are there, it would be great to have another dinner. 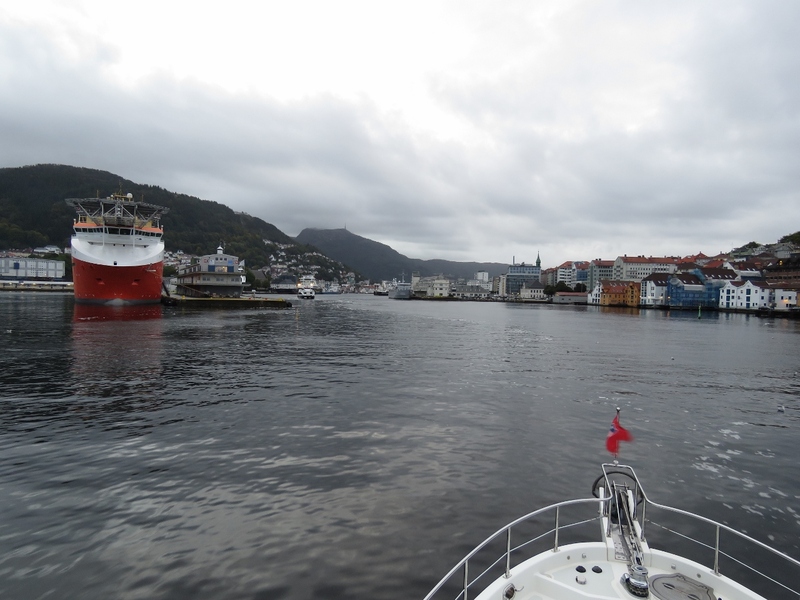 Our nearly 6 month stay in Norway was unusually interesting. Lots of history, incredible boating, and unmatched natural beauty. We’ll keep in touch. 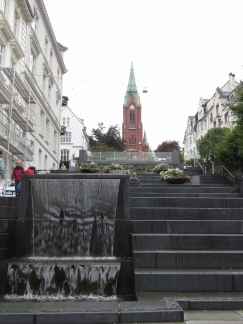 Have a great time in Denmark!